In case you decide animal products aren't for you. If you’ve ever seen Food, Inc. or wondered where our food comes from, chances are you’ve considered being vegan at some point in your life. 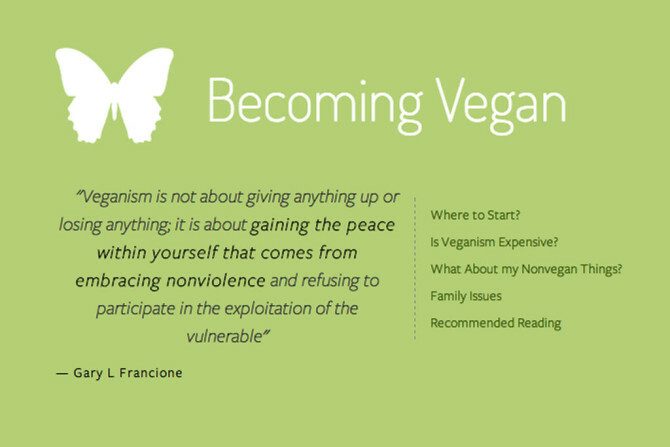 Vegan Starter Kit may just be the resource you need to help you make the change and convince others to as well. 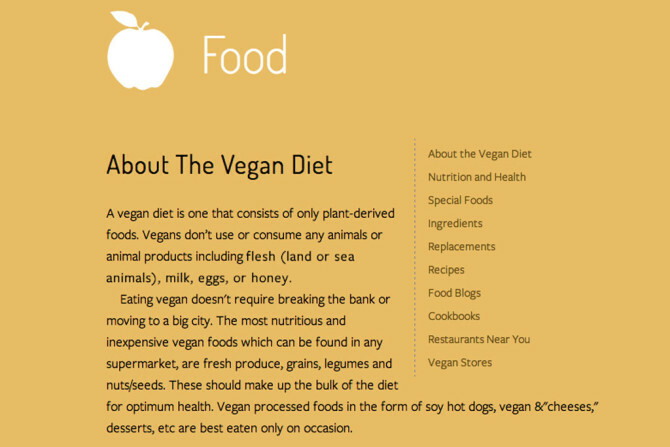 The elaborate website comes with seven sections on how to go vegan (and if that’s the right choice for you) with consideration towards all aspects of your life in addition to food. 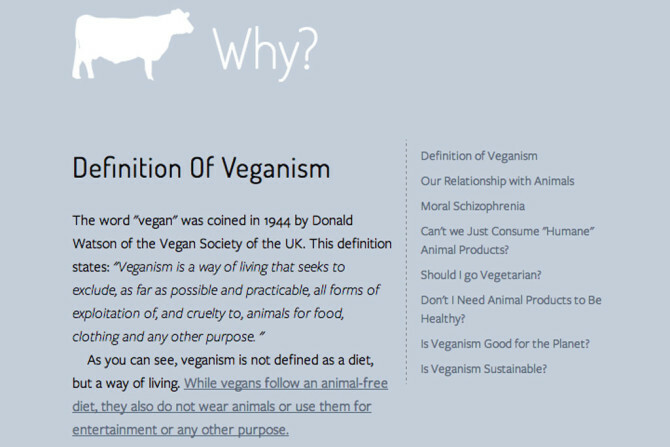 The website includes several convincing reasons to go vegan as well as common questions that beginners usually have toward making such a drastic change in their lifestyles. On the side there’s even a count of how many and which kinds of animals have been killed since you clicked on the page, translating brutal statistics into a relatable form. Although much of it is very intended to be persuasive toward a specific side of the argument, the compelling information offers a useful resource for anyone interested in making the change. For those that are less inclined, remember it’s not necessarily the best choice for everyone personally and that a dietary change is an individial decision. Should you decide to go vegan, this section on the website offers advice on making the shift, from answering common questions to offering relevant reading material on the topic. On the side are a range of YouTube videos that illustrate veganism and include different people in all walks of life who have made the choice to go vegan. When people discuss being vegan, it’s mostly seen as a dietary choice; however, the vegan diet is only one aspect of a vegan lifestyle. This section explains what to avoid as well as substitutes for common household ingredients that are beyond the restrictions of the diet. Since nutrition and health are one of the most controversial points on the topic, this section even includes information on how to maintain a healthy lifestyle without having to resort to consuming animals or animal products. On the side there’s even a Free Vegan Nutrition Pamphlet to download and keep with you while you learn the ropes. As I said earlier, veganism is about more than just a new diet. Wearing animals is also a problem that conflicts with a vegan lifestyle. 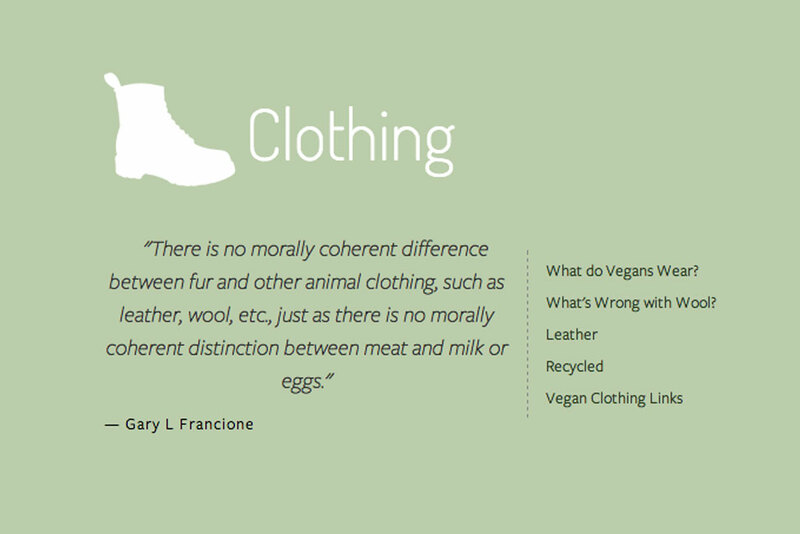 The website provides links for a range of all-vegan stores both in person and online. People are often so focused on the animals they’re potentially ingesting that they forget what might have contributed to the clothing on their backs. I guess this looks like goodbye, leather and wool! 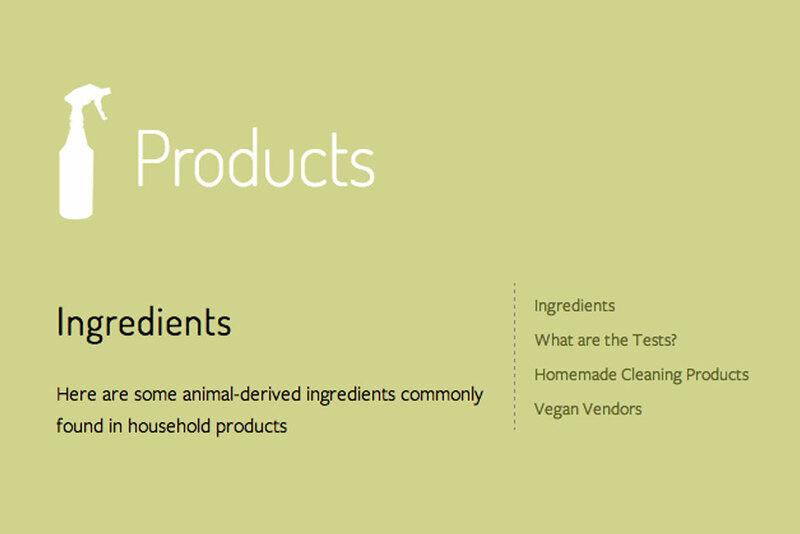 Some household products have ingredients derived from animals. Others might come from brands that partake in animal testing. Either way, the website offers vegetarian and vegan alternatives to common household products—both ones you can buy as well as ones you can make at home! On the side there’s even a free print out of companies that test or don’t test on animals, a convenient sheet to have on hand at the local grocery store. 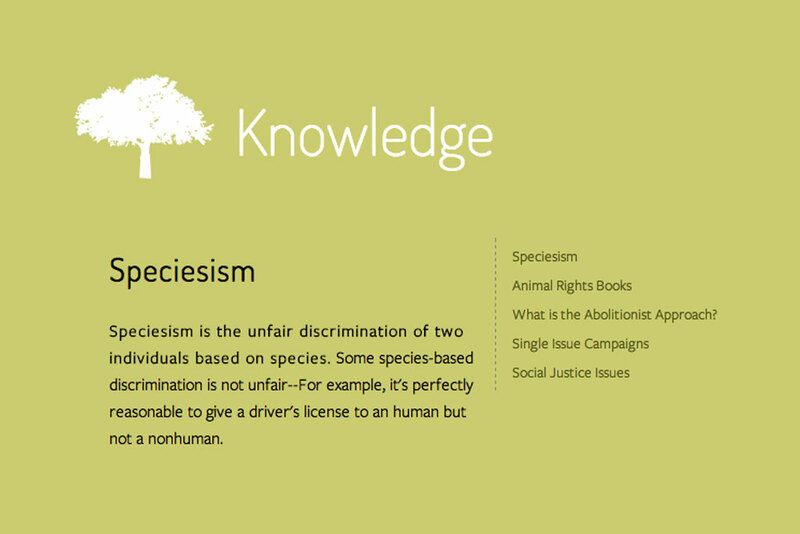 Although we have very limited knowledge about the first-hand experiences of animals, Vegan Kit argues that certain aspects of animals such as sentience (consciousness) have been proven. This section includes books and films relevant to the ongoing debate as well as resources going toward the animal abolitionist cause. Again, Vegan Starter Kit provides essential knowledge for basic veganism but is by no means forcing you to adopt that lifestyle. Although I haven’t made the shift myself yet, this website makes a compelling argument to at least put an effort towards challenging myself to adopt a more humane lifestyle and reduce my carbon footprint.